According to the author Coxe, the areas of Nan Tuck's Lane and Tuck's Wood are haunted. They take their names from the unfortunate victim, a woman named Nan Tuck. She was accused of being a witch, and despite seeking refuge in a church, she was subjected to trial by water. She managed to escape and was later found hanging in what is now known as Tuck's Wood. However, some believe that the woman did not commit suicide but was murdered by the villagers. Consequently, they would avoid the areas of Nan Tuck's Lane and Tuck's Wood, especially after dark. It is said that she still haunts these locations. Pictured left is Nan Tuck's Lane courtesy of Simon Carey. Buxted is a village in East Sussex, England. 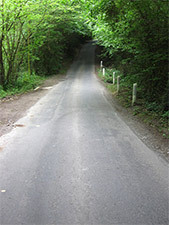 Buxted lies partly within the High Weald Area of Outstanding Natural Beauty, although the village itself is outside it. Pictured left is Buxted Woods courtesy of Simon Carey. Licensed under CC BY-SA 3.0 via Wikimedia Commons.